After analyzing 5,750,000 books on Goodreads, Otis Chandler shares his insights on the evolving nature of book discovery. The short version: once isn’t enough. John B. Thompson sums up the challenge facing publishers and authors today: abundance has irrevocably changed the publishing industry, and it has made discovery the central problem facing the book business. At Goodreads, our passion and mission is helping readers discover and share books they love. 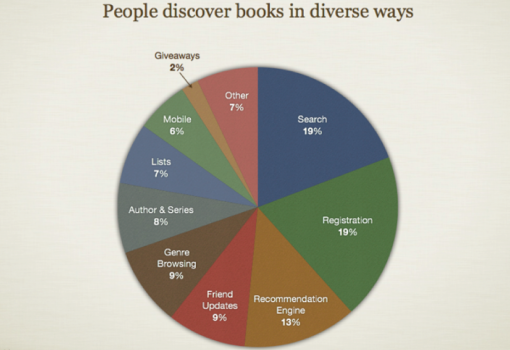 In our work with publishers and authors, we see several book discovery trends developing. Some of these trends I shared in a speech at Tools of Change in New York last month. We analyzed a staggering 5,750,000 books that Goodreads members discovered (added to their to-read shelf) in January 2012, and broke them down by how the members found them. The readers adding those books lived in hundreds of different countries (though the US is our largest market), and represent both avid bookworms and casual readers. Understandably, the findings only talk about book discovery on Goodreads but, with the world’s largest community of readers (more than seven million members), much of what we’ve found is relevant to book discovery overall. And it has worked. According to a recent survey of Goodreads members, 79% of them report discovering books from friends offline, and 64% find books from their Goodreads friends. Interestingly, the power of a friend’s recommendation has grown. Today, the recommendation doesn’t even have to be explicit, it can be as simple as seeing a friend reading a book. When you see what a friend is reading – whether on Goodreads, through an update on our Facebook Timeline app, or in person – it automatically triggers your interest. It becomes a new form of a recommendation, social validation. But how do you start that word of mouth process in the first place? Increasingly, publishers and authors are recognizing the importance of reaching readers directly early in the life-cycle of a book. For example, some are running giveaways on Goodreads nearly six months in advance of publication to generate pre-release buzz. The winning readers write the first of those crucial reviews, their friends start adding the book to their shelves, and the momentum starts to build. In January 2012, we ran 1,065 giveaways that attracted 839,145 entries. Traditional media remains very important, as well. We were able to track how solid media appearances can build initial awareness for the word-of-mouth effect to start. 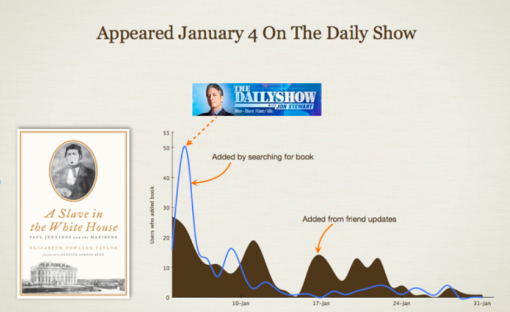 You can see in the illustration below that there was an initial surge of Goodreads search interest in A Slave in the White House after it was featured on “The Daily Show.” Notice how word of mouth picked up as other people saw it on their friends’ updates and added the book as well. As the traditional outlets for books continue to decline, the relationship between the author and the reader will be more important than ever, especially in building that pre-launch buzz. In a survey of more than 3,000 Goodreads members, 96% of people say they read books by authors they already know. This is why building a loyal following of readers will pay major dividends for authors when they publish their next book. 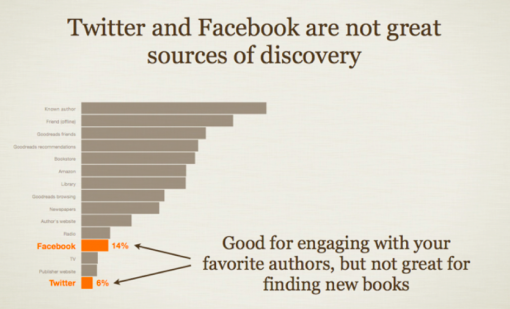 Interestingly, very few people say they hear about new books to read on Facebook and Twitter. Don’t discount Facebook and Twitter completely; they better serve authors as tools for further engaging with their existing fans. And these are the people you should start with when launching a new book. Early marketing efforts should focus on the author’s existing fan base, as these readers are not only easier to convince to read a book, but more likely to become emissaries for that book: recommending it to their friends, blogging about it, and adding it to Goodreads lists. Increasingly, the author’s job will be two-fold: to write a great book and to keep his readers engaged and interested while he writes the next one. Another great way to feature prominently in readers’ minds is by getting in front of them, literally. Author video chats and other means of directly talking with readers are going to be increasingly important in the coming years. The author tour, once a staple of many book launches, might be replaced by the more economical video chat. Would an author be better off flying around the country to visit a handful of stores or meeting with an infinite number of book clubs via live video? Through programs like the Goodreads Author Program, authors will be able to connect with any reader any time, anywhere, instantly. 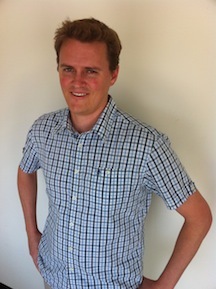 We recently featured the author S.J. Watson, live from his flat in London, taking questions on video from Goodreads members in Australia, Portugal, and Argentina. Again, the old rules no longer apply. There is no one silver bullet when it comes to getting your book discovered. There is one rule, though – your book needs to be “discovered” multiple times by a reader before they will decide to read it. What that combination of discovery methods looks like is the fascinating dilemma we face. And it is likely to be unique to each and every book. The success of your promotional campaign rests largely on your ability to encourage discovery via this panoply. For this post, I focused on how to get a new book discovered. On Goodreads, we’re also helping people discover backlist, midlist and long-tail books. You can find out more on the Goodreads blog – the full presentation from Tools of Change is embedded at the end of it. The next few years will shape the industry for decades to come. The people and companies that will thrive in this era are those who embrace and understand the new rules of abundance. Experimentation is key – technology will continue to create new ways to enable discovery so even more opportunities are on the way. It’s going to be a wild ride, but this is probably the most exciting time in publishing since Gutenberg started playing with reusable letters cast in metal.